Phase II of the project is starting and there is no certitude affected population's concerns will be taken into account. Failures of phase I risk to be repeated. 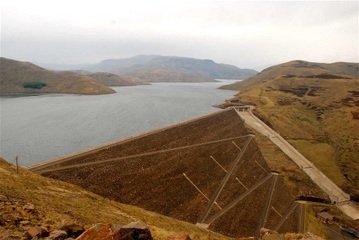 The Lesotho Highlands Water Project involved the construction of five dams and over 200 km (124 miles) of tunnels. These dams supplied power for Lesotho and water to the Republic of South Africa. The project was supported by the World Bank in partnership with Impregilo, an Italian company accused of corruption in 2004. At the start of the project, 3,000 hectares of arable land and 1,000 hectares of pasture land were flooded. Local communities did not receive economic compensation and the project worsened their already precarious living conditions. The World Bank has declared Lahmeyer International, a German company, ineligible to be awarded Bank-financed contracts for a period of seven years, because of corrupt activities in connection with the Lesotho Highlands Water Project (LHWP). The World Banks Sanctions Committee found Lahmeyer engaged in corrupt activities by bribing the Lesotho Highlands Development Authoritys Chief Executive, Mr. Masupha Sole, the government official responsible for contract award and implementation. In 2015, Khabang Lejone Multipurpose Cooperative sued Lesotho Highlands Development Authority (LHDA) in order to force the authority to pay compensation to the affected and displaced populations from the phase I of the project. Project Details The project involves the construction of 5 dams, a network of 200 km of tunnels and pipelines, and a hydroelectric plant. The Katse dam is 185 meters high, and the pipeline is 48 kilometres long. The reservoir has 350 million tons of water. There were 95 tremors in 16 months (1995-1996). In 2016, the project enters its second phase which includes the construction of a reservoir (Polihali), and a hydropower generation station whose energy will be delivered to South Africa. The completion is expected to be acheived by 2023  and its costs will reach at least $US 1.9 billion . Development of Alternatives They dont want the construction of the new dams,the old ones should be dismantled and the area restored. Why? Explain briefly. Two dams were built and it is planed to built three dams more.